Recently I've fallen a little in love with style blogs. I often get stuck for ideas on putting outfits together and I find these really do inspire and give you ideas on dressing outfits and accessorizing. So here are my top 6 style blogs! I have quite a similar style to Zoe, obviously there are things she wears that I won't wear myself, and visa versa, but this blog is one of my favorites. The people that own the blog clearly put a lot of time and effort into answering peoples questions, finding things Zoe has worn, helping people with choices, and putting together little collages of Zoe inspired outfits. 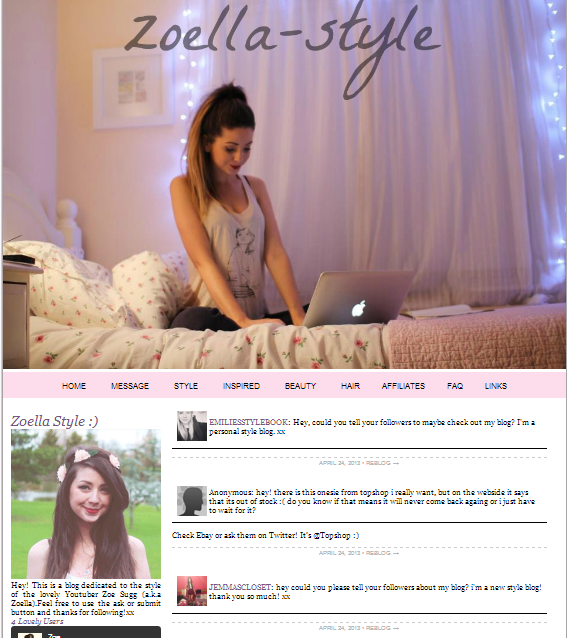 I've noticed plenty of people on twitter mentioning how they wish they could find somewhere where they can see Zoe's style, and I always recommend this site. I always check it everytime I get paid to see if there's anything they've mentioned that I like, and there usually always is. It's a great place if you have a style that's similar to Zoe's as all the clothes are very much her, and I love how they find exact clothes as well. Now, I don't watch this beauty guru personally, but I do really like her style, and I love the outfits that the owner of this blog puts together. They're all very pretty and a little girly, which matches my style well. I wouldn't wear an awful lot of these outfits, as they personally wouldn't suit me, but I still love looking at the posts as they still give me inspiration and I just love the taste in fashion on this blog. The Carrie Diaries is one of my favorite TV shows, the outfits on there just make me swoon and wish I had a lovely mature style like that, so this blog is perfect. The outfits are unbelievably pretty and adorable, and quite colorful in some cases, but the owner of this blog does a very good job at finding the outfits and putting the posts together! Now I'm not the hugest fan of Lucy hale's fashion myself, she does dress maturely and she pulls the clothes off AMAZINGLY, but they're not for me. However, on this blog I absolutely adore the Aria posts! I've spent ages watching pretty little liars and just admiring their clothes, Aria being my favorite with her fashion choices, so when I found this blog it was a lifesaver. I always find myself checking this blog when I'm shopping online to see if there's anything I like, and there usually always is! 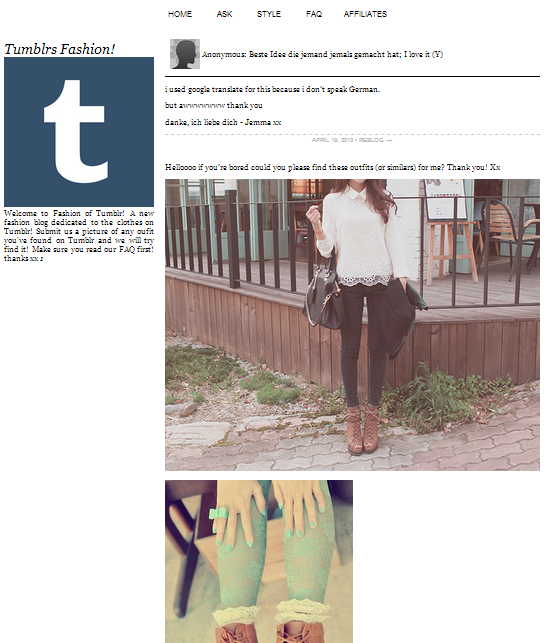 When I first got tumblr I remember reblogging loads of fashion posts and wishing I owned clothes like that. What this blog does is it finds where I can get either exact or similar pieces to ones in the pictures, you can even request some as well if you have a picture in mind. This is always on my checklist of fashion tumblr's to check, and if I ever see a picture of an outfit I like I always send it in and hope they can help. What I have with this blog is that I like the inspired posts the most. I'm not the hugest fan of the girls, but some of their outfits are just beautiful. 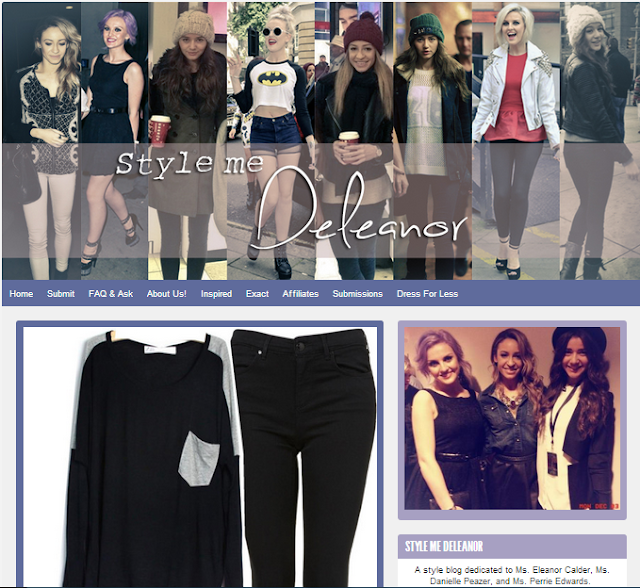 I think out of all the posts, I like Perrie's style the most. There's a lot of clothes she wears that I'd probably never wear myself, but there's an awful lot more clothes and accessories that If I could afford, I'd buy! They do a good job at finding exacts on this blog, and I really like how they have a 'dress for less' section. Do any of you guys like looking at style blogs? If so comment some down below and share them with the rest of us, I love looking at new blogs, you never know what you can find!